The Farmer Gym Way is a 14-week strength, conditioning, and cardio program designed to improve one’s strength and overall fitness level. With heavy-weight lifting, high-intensity interval training, and endurance-based training, the program challenges the whole body, both anaerobically and aerobically. The Farmer Gym Way anticipates that you will work out 4 days a week, with 2 days of built-in rest, and a day of running once each week – except for the 3 deload weeks and 2 testing weeks. You will proceed through the program day by day, just as you would a daily calendar. To use The Farmer Gym Way, you’ll need access to a gym, or to have several pieces of equipment at your disposal. The equipment: Barbell and accompanying weight, Dumbbells, Kettlebell, Pull-up Bar, Dip Box/Bars, Box, Jump Rope, Rower, and Treadmill/Track. "Since I live in the middle of nowhere (or used to) I have had to work out by myself in my garage. I have a pretty good setup complete with a rower, power rack and pull up bar, amongst other things. The only thing missing was some good programming. I turned to some big sites such as Sealfit, Misfit Athletics (they are sending 4 athletes to the 2018 Crossfit Games), Crossfit Invictus and several other local boxes for my programming. I saw some results from all these sites, but something was always missing. Enter Farmer Gym and Coach Harle! I met Jason back when he was a coach for Crossfit Ankeny for a short time and let me tell you, the man definitely knows his stuff. 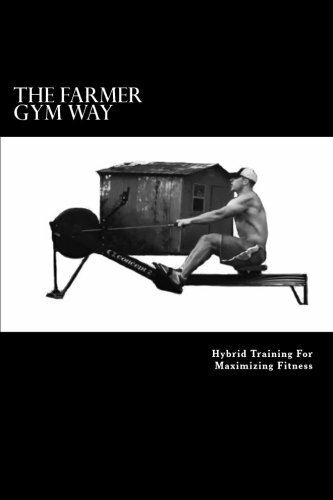 I saw he created Farmer Gym, but could never quite pull the trigger on buying a book until this past April when I purchased the 14-week The Farmer Gym Way book off Amazon. I dove in with both feet, and let me tell you I wish I would have bought this book YEARS ago. During testing week my 1 rep maxes for Deadlift as 325 and for strict press was 125. By week 12 I hit those weights for a 6 set of 3 reps! During the course of the book I moved from a 53 lb kettlebell up to a 70 lb one, figured out my double unders, finally, after 6 years of struggling with them, and shaved time off of every single workout in the book as I made my way through it. Coach Harle is extremely responsive to questions, and willing to coach form and give advice the best he can if you send him videos. If you’re willing to #dowork, I promise, you WILL see results with his programming." Perform as many Pull-ups as possible in 8 minutes. Every time you come off the bar, there is a 12 Kettlebell Front Squat penalty. *For those unable to perform Pull-ups, execute Inverted Rows.